China and Japan are expected to hold a new round of talks on gas exploration in the East China Sea in Tokyo Thursday, the Foreign Ministry said Tuesday. The row over the gasfield is one of several issues that have dragged ties between the two countries to their lowest ebb in decades. 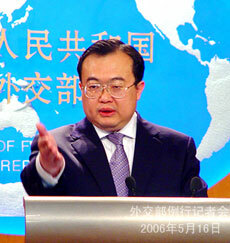 Hu Zhengyue, director of the ministry's department of Asian affairs, and his Japanese counterpart Kenichiro Sasae, head of the Japanese Foreign Ministry's Asian and Oceanian affairs bureau, will be top negotiators for the two sides, Foreign Ministry spokesman Liu Jianchao said at a regular news briefing in Beijing. The two sides will continue to exchange views on the East China Sea issue and the Chinese side believes that the consultation will help both sides reach broader consensus and narrow differences, Liu said. However, he added: "Because the two sides' differences are still big and some issues are very complicated, it will be hard to make any breakthroughs in this round of talks, I believe." "We will take part in the talks with a responsible and positive attitude in a bid to narrow the gap between the two sides," Liu said. Since October 2004, China and Japan have convened four rounds of consultations on the East China Sea issue, the last taking place in Beijing in March. Beijing says it has rights to the gas but Tokyo claims the two countries should share them. Meetings aimed at resolving the dispute have ended in disagreement. The talks will take place as the two sides are making efforts to improve bilateral relations strained by the gas dispute and, in particular, by Japanese leaders' repeated visits to the Yasukuni Shrine, where Japan's war criminals of World War II are honoured. Responding to a question about a US offer to China to watch military exercises on the Pacific island of Guam next month, Liu said the Chinese side will "actively consider" the invitation. China welcomes the US offer and believes more contact between the two countries' defence forces could increase understanding, Liu said. Commander of the US Pacific Command Admiral William Fallon made the offer during a week-long visit to China that ended on Monday, aimed at improving defence contacts between the two countries. The US-led drills on the military outpost are expected to take place in mid-June. Liu also said a series of co-operative agreements and documents are expected to be signed between China and Germany when the German Chancellor Angela Merkel visits China starting next Sunday.